This card got made last night in a super duper hurry. I totally let it slip my mind that I had been chosen as one of the winners in the last challenge at the Catered Crop so I was invited to be a guest designer. 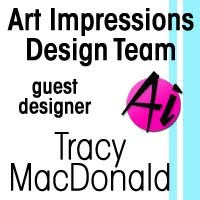 Some of you may remember that I was a member of Linda McClain's amazing team for a while. She has decided to close the challenge because, like many of us, there are tons of other things in her life taking precedence. I was honored to be a part of her team and I am honored to be able to share one of my cards as inspiration for the very last Catered Crop challenge. Linda, I wish you ALL the best!!! I think I have become a bit obsessed with stitched dies. This cool tag from Pretty Pink Posh came in yesterday's mail and I wasted no time putting it to use. I also used dies from Impression Obsession and Lawn Fawn. I masked off the inside of the tag and used some Distress inks to create the sky. The sentiment is embossed in Ranger Liquid Platinum. Now that I've talked about everything else on the card I'll tell you that the image is Purple Onion Designs Icicle the polar bear. Obviously I did not make him a polar bear. I have a couple more of their cute stamps in my stash. I know that a lot of my friends in both the north and south are in the paths of some nasty weather today. Stay safe and be blessed! Beautiful card, Tracy. I love me some stitched dis too! And those tree dies, swoon, such a beautiful scene you created! Don't you just love that stitched tag die? I love how you've used it on your card. Such a sweet scene and that bear is precious! Beautifully done. Hugs! I love this! So cute! I'm a fan of stitched dies too! It's crazy how you made that tag blend so perfectly with the bg papers and the red trims and highlights are wonderful!! This is a superb Christmas card tribute to a wonderful lady and challenge site. This is gorgeous Tracy, such an adorable image and I love all your detailing on the tag. I can certainly relate to your obsession to stitched dies, they just look so fabulous! Oh my stars... What a cute tag. I LOVE it my creative friend. Oh me or my! This little guy is so darling, and you are so freakin' talented. Thank you for all you've done for little Catered Crop. You are amazing! Love you! This is just too cute! Love the stitched dies too! Also, the bear...too stinkin' cute! Such a sweet card! I love blue for Christmas, the touch of red is the perfect accent. Love the cute image. One would never know it was made hurriedly, it's perfect! Hugs! How very cute!! Love all the details and gorgeous colors! Beautiful and so adorable tag. Love the colors and background. Just cute. Thanks for playing along with us at Tuesday Throwdown! That is really cute! I'm so glad you told the numbers of the Copic markers you used. That is so helpful in learning how to color with Copics. Thank you. As I already said on Facebook, I'm totally in love with your card! This bear is so cute ♡ Great use of all the dies, too! Well done, my friend! OMGosh, that tag is just amazing! I LOVE the stitched shape and LOVE the pretty white trees! the inked background and all the sequins and birds are gorgeous. LOVE the little bear, too! OMGosh! LOVE! Such a lovely cute card!! Love your attention to detail ... Have a fun week! What a delightfully sweet card and tag! The design is eye catching and I love the color palette on your design. Thanks for joining in on the fun at Tuesday Throwdown. Oh, this is so sweet! Wonderful card! Thanks for playing along with TYI! Unbelievably cute and so well done! Love those amazing dies and the dimension you've achieved! Gorgeous! You surely know how to create such a cute card! Your tag is gorgeous, love all the detail on this. And that little bear - so sweet. I have some of the purple onion stamps as well, they are so adorable. Wonderful card Tracy, thanks for the inspiration once again. Oh, Tracy! You've done it again!! 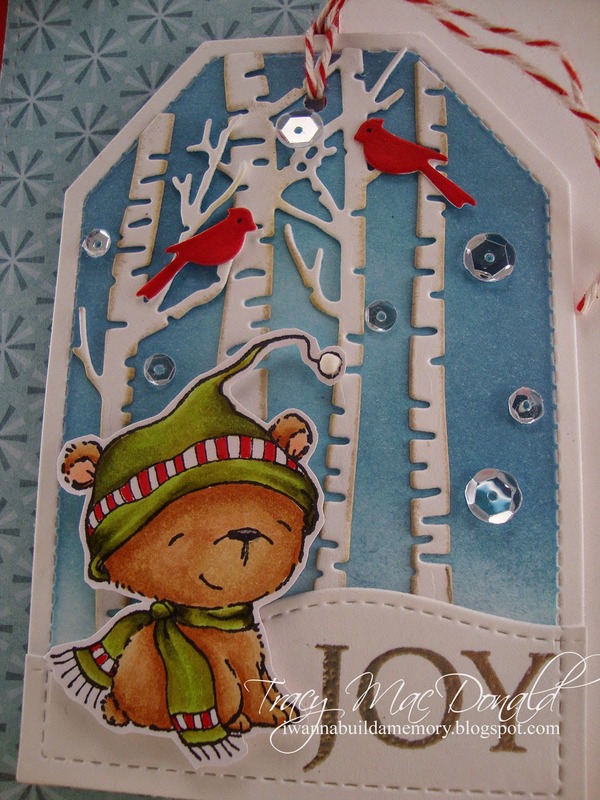 Love this darling bear and the amazing tag with the dies!! Stunning in every way! Warm hugs and a blessed Thanksgiving! He's definitely a little cutie and I love the die-cut trees in the background. 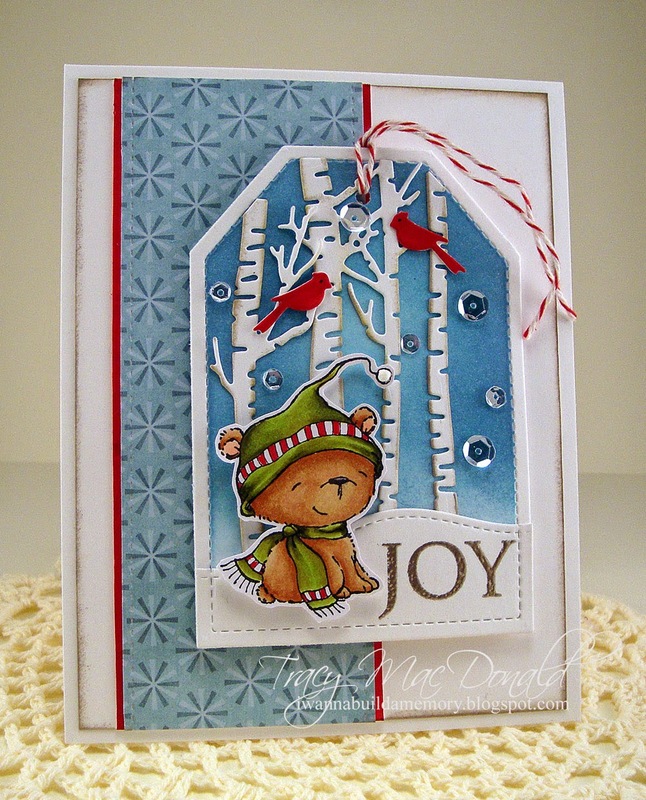 Thanx for sharing with us at Fantasy Stampers. Oh my word!! This is just darling!! I LOVE how you created the background of the tag and the little image is just adorable!!! Totally, totally fabulous design! !